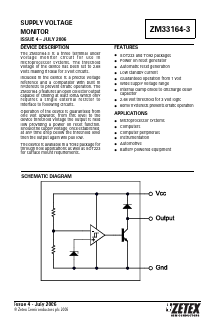 ZM33164-3 Datasheet PDF - Diodes Incorporated. The ZM33164-3 is a three terminal under voltage monitor circuit for use in microprocessor systems. The threshold voltage of the device has been set to 2.68 volts making it ideal for 3 volt circuits. Included in the device is a precise voltage reference and a comparator with built in hysteresis to prevent erratic operation. The ZM33164-3 features an open collector output capable of sinking at least l0mA which only requires a single external resistor to interface to following circuits. Operation of the device is guaranteed from one volt upwards, from this level to the device threshold voltage the output is held low providing a power on reset function. Should the supply voltage, once established, at any time drop below the threshold level then the output again will pull low. The device is available in a TO92 package for through hole applications as well as SOT223 for surface mount requirements. IMP1832S 3.3V ÂµP Power Supply Monitor and Reset Circuit View A1 PROs co., Ltd.